Residents knew violence was coming — but the city and cops refused to stop it. For much of the nation, the events of the Unite the Right rally here in Charlottesville were unexpected — but our community has been preparing for it for months. Despite President Trump’s insistence that both fascists and their counter-protesters were responsible for violence at the Unite the Right rally last Friday, reports from Charlottesville make it clear that white nationalists have been planning unspeakable harm toward the Charlottesville community for months. In response to these threats, Charlottesville’s citizens were quick to denounce white supremacy, and worked diligently to protect those threatened. Back in May, a torch-wielding group gathered by white nationalist Richard Spencer protested removal of the General Robert E. Lee statue that looms over what was then called Lee Park, but has since been re-named Emancipation Park. On June 8, a few days after the name change became official, a North Carolina-based KKK group held a rally for the same purpose. Among locals, Facebook timelines were peppered with hashtags marking this as a summer of resisting hate, led by the outspoken, grassroots activists who planned to block white supremacy and stand up for the community. 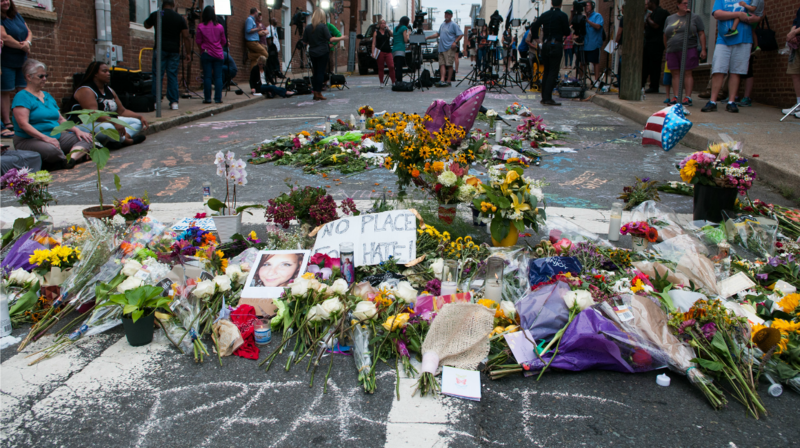 According to multiple sources, Charlottesville activist organizations spent weeks presenting local authorities with blog posts, messages, and other evidence that pointed toward the white nationalists’ plans to bring violence during the weekend of August 12. This evidence included proof that this group was distributing activists’ personal information and was threatening to meet them in person. One local activist, whose name is withheld for privacy, tells me, “We told the city for months and provided evidence all of the threats. The evidence we presented to city council is on Solidarity Cville. We hand-fed information to show them how violent these people are. [An associate] provided this to the humanitarian board and urged them to put a stop to it.” She also mentions specific threats toward members of the city council (such as Vice Mayor Wes Bellamy) and the Chief of Police, Al S. Thomas Jr., that were received independent of the evidence provided by community members. White nationalist blogger and Unite the Right rally organizer Jason Kessler’s right to free speech was cited as leaving the city vulnerable to potential lawsuits. If they denied the rally permit, the city could end up with a mess of legal fees. So, the threats were essentially ignored, and the rally scheduled as planned. But Charlottesville officials were not planning to stop it. In the meantime, the local social justice community was motivated to try other tactics to shut down Kessler, including confronting him at restaurants with anti-racist chants. They also continued to show up to city council meetings and speak out against the string of hate-based events being permitted to happen in the city. Activists of all races wanted it to be clear: Jason Kessler and his supporters are not welcome here. Most Charlottesville residents didn’t expect the Friday night tiki-torch march that overtook Nameless Field at UVA, preceding Saturday’s rally. But sources say law enforcement and local activist groups received an advanced tip that the rally was going to happen. However, without confirmation of a location, plans for police protection were inexplicably absent, and counter-protests were difficult to arrange. When word traveled through campus, a group of about 20 UVA students organized and bravely stood up against about 200 angry white supremacists with tiki torches. The severely outnumbered students were chanting “Black Lives Matter” in response to the supremacists’ Nazi-esque “Blood, not Soil” and “Jews will not replace us” refrain. When face-to-face with the alt-right, the students suffered through being pepper sprayed, having torch gas thrown at them, and being thrown to the ground. A member of multiple local activist groups tells us that a number of antiracist activists were nearby attending an interfaith church service. They were willing and wanting to help the students. Instead they were on lockdown, stuck inside the church. There were many requests to bend the rules of the lockdown, but with the nature of threats outside unknown, security at the church refused to let the students in for protection or let the antifa groups out to help. A local anarchist collective, unnamed to respect their privacy, put out a national call for additional counter-protesters and anti-fascist support. Black Lives Matter representatives from places like Baltimore and New York showed up to support our local activists. Medics from other states drove in to provide support in case there were assaults. Many hands were at work in the organization of an effective counter protest, such as the UVA professor who arranged for all day permits at two other downtown parks to provide safe spaces and medic tents for counter protesters. More than one interviewee names the atypically powerful and efficient combination of social justice networks in Charlottesville as masters in tackling the overall job of providing training, resources, and safety in numbers to those who came to protest the invasion of Nazi ideology. Like the city, Charlottesville’s organizations are small but clearly mighty. With civil rights activists so well-prepared and organized, it begs the question: How did the police prepare? While we do know that local and state law enforcement were on the ground at the rally, there appears to be very little evidence that they intervened throughout the many altercations that occurred. Zaslow, the volunteer street medic, says she reached Emancipation Park at about 8:30 in the morning, along with the clergy of Congregation C’ville and Cornel West. The police in riot gear were nowhere to be found on the street outside the park. Instead, they were met with a small army of what she believed to be white nationalist militia — fully armed with machine guns, ammunition, and a hefty dose of intimidation. Eventually, Zaslow noticed a handful of police officers behind the large fences that had been erected to block off the park. The officers had little visibility to see what was going on beyond the fence. Charlottesville-based documentary photographer Ézé Amos was also a part of that scene. He was physically assaulted when a man from one of the fascist groups punched his camera into his face. Amos tells The Establishment that he was continuously threatened. When he got caught in the pepper spray crossfire and no law enforcement intervened, true fear set in. Still, Amos continued the heavy work of documenting the results after the rally was declared unlawful — and as opposing groups took to the streets with little direction, protection, or plan for what was to happen next. A member of the press, Amos followed the white supremacist rally leaders to McIntire Park, the location to which, earlier in the week, city officials attempted to relocate the rally permit. He watched, and photographed, as white supremacists gave their planned speeches. Without a law enforcement background, it seems reasonable that at least a handful of officers would have been at this second location. The city considered McIntire park the best place for the rally. For days, there was some confusion over whether the rally would take place at McIntire or Emancipation Park, making it likely that even just a few stragglers would end up at McIntire. One counter-protester, who declined to be named due to safety concerns, only saw the police in riot gear as she marched with the Black Lives Matter group on the Downtown Mall (a block over from Emancipation Park). Officers were methodically sweeping the mall and clearing people out, and staying in close proximity to the primarily black group in the earlier part of the day. The next time she noticed a significant police presence was about 20 minutes after the car attack that killed one person and wounded many others, her friends among them. Having attended the rally in July, she says this is a “stark contrast” to last month’s KKK rally, where the cops seemed to be all over. Another man interviewed saw police on top of buildings near the Downtown Mall, but few on the ground where he was, just steps from both the site of the car attack and the now viral assault of 20-year-old Deandre Harris. Everyone I spoke to agreed. The police were inactive and, in most cases, invisible. After the declaration of unlawful assembly was made, and the racist contingent declined to disperse willingly, police did tear gas the white supremacist and neo-Nazi groups at Emancipation Park. However, it seems cops also failed to follow any dispersal tactics, sending a river of armed, angry, aggressive fascists into a sea of those who were there to reject their message of hate. And according to Zaslow, this declaration of unlawful assembly came more than an hour after the fascists began throwing water bottles (both disposable and not) and pepper spray bombs out beyond the park barricade, and into the crowd of counter protesters. Nazi groups relied on a plethora of different tactics to terrorize their opposers and the City of Charlottesville. Some wore full masks, which is illegal in Virginia, and tried to steal the phones of those recording them. Others can be seen on livestream videos beating anti-fascist protesters. There was a constant barrage of verbal attacks, screaming in the faces of even the peaceful protesters, and harassment of anyone who showed up to to stand up to hate. They even made it a point to march to Charlottesville’s largest housing project with the intention of starting fights with black residents. The residents of Friendship Court, the housing project, quickly chased away the racists, but not before a large group of antifa had followed behind in an effort to help protect the neighborhood. It was on the return walk to the Downtown Mall from Friendship Court that the now infamous car assault and murder occurred. Days later, at 4:30 in the afternoon, Charlottesville’s downtown mall has confounding energy. There’s the familiar feeling of walking the mall with the normal sights of parents chasing children as they zig-zag happily along the brick paths and a street musician playing for tips. And there are few indications of the weekend’s events, which is both jarring and unacceptable. This small street carries the rawest of emotions, directly contrasting the everyday mood of the rest of Charlottesville’s Downtown Mall. Here, nearly everyone is crying or choking back tears. Here, nearly everyone is speechless in a way that makes the air heavy with sorrow. Here, you are humbled by the guttural magnitude of loss. Here, for at least a moment, the questions about this weekend’s events become singularly focused.